It’s New Year’s Eve. 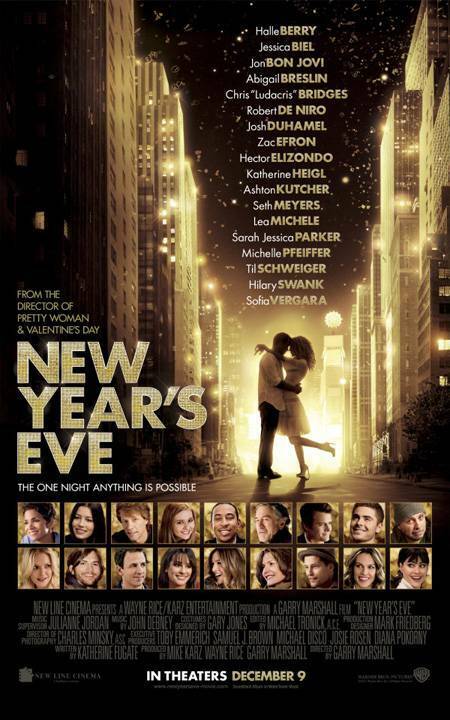 And we follow a gaggle of storylines that culminate in the big New Year’s Eve party that everyone who’s anyone attends. Ingrid (Michelle Pfeiffer) is an introverted administrative assistant who works for the company that throws the party. Delivery boy, Paul (Zac Effron) is a regular at her office. He spies the tickets to the party and practically drools all over them. Ingrid promises the tickets to Paul if he can help her complete everything on her resolution list for the year that is about to end. Stan Harris (Robert DeNiro) is spending his dying days in the hospital (being attended to by Halle Berry and Cary Elwes). He has alienated all of his friends and family, so he is dying alone. His last wish is to spend the night on the roof so he can see the ball drop on Times Square one last time. Jessica Biel and Seth Meyers find themselves in a race to have the first baby of the new year and win $25,000. Sarah Jessica Parker is torn between letting her daughter, Abigail Breslin, hang out with her friends watching the ball drop, while worrying about her safety. Ashton Kutcher hates NYE. He ends up stuck in an elevator with Lea Michele, a backup singer for the evening’s entertainment (who longs to be the star). Katherine Heigl is catering the party. Jon Bon Jovi is her ex-boyfriend/fiancé performing at the party. Instant tension because they were in love and he left her to go on tour. Hilary Swank is in charge of the ball drop for the first time. She’s understandably nervous as everything goes wrong. Including the ball not lighting up and getting stuck mid-ascent. I’m sure I’m missing a few storylines. And most are intertwined, and resolve themselves nicely. Exactly as you would expect. The movie is a veritable who’s who of Hollywood. If you find yourself playing Six Degrees of Kevin Bacon, this is a movie for you. And I would also like to welcome you to 2011. We don’t play that anymore. It’s a fluff chick-flick. It’s predictable and gives you that warm, fluffy feeling. Or something like that. Now, I’m obviously not the target demographic. But I know several who are. They weren’t overly fond of it, either. I was told, “It’s not about the predictability. It’s about the fun.” I have to say, it was heavy on predictability. Less so on fun. I called everything. They tried to make you cry. Didn’t work. And it had too many story lines going on at same time. Some just came out of nowhere. Zac Effron and Sofia Vergara (I enjoy her body…of work) had all the funny parts. The few times I laughed, it was when they were on screen. Katherine Heigl plays Katherine Heigl. Every role she plays is virtually interchangeable. The gag reel was the best part of the movie. I’m not saying you shouldn’t see the movie. But I’m not saying you should.